The project: Creating audio (musical / spoken word,combination, etc) using "spam" (or "unsolicited electronic mail") email text as lyrical or thematic content. What began as a simple administrative announcement on a Yahoo Group has become a CT-Collective Project. A person, virtual or real or both, by the name of “Teisha” started spamming the group with clearly “off-topic” posts. Users complained, and the moderator of the group took action. He sent an email to all stating that “Teisha is now banned.” Then someone suggested (I don’t know whether seriously or not) that “Teisha is now banned” sounded like a good name for a CT-Collective project. A few others, including myself, chimed in and after some exchanges, the project was created, and later formalized. The guidelines were simple: create a piece of audio using “spam” content as main thematic material. In creating this piece I approached the concept of spam at a personal level. Every now and then I empty my hard-drive of folders containing sound experiments but nothing as extreme as actually deleting them completely, they make it to a CDR archive, were they remain in a digital deep freeze.By imagining these unused sound files as a kind of sonic spam, I’ve chosen files with specific atmospheres, which have been re-recorded in FFWD because when I was skipping through the tracks I thought this process resembled the way I navigate my inbox. So the results were deconstructed and rebuilt, mixing and looping the separate sounds to frame the lyrics, originally from spam mail ‘Subject’ lines that inevitably got elaborated and embellished upon. Used a few hundred subject and timestamps from my spam folder and had “Ralph” and “Victoria” read them using Mac OS X’s Text to Speech application, along with short “teisha” and “teisha has been banned” text files. Used Ambrosia’s WireTap Pro to record to QuickTime. Switched between the looped-in-QuickTime spoken word files fed into my multiple effects pedal signal chain, manipulated and captured loops as I went along creating layers. It's like a radio play ... amazing stuff David! More of this! I thought this track was a brilliantly woven tapestry which segues from one piece of music to another, each in a different style, interleaved with passages of spoken word, and with a gradual building up of subtle references to spam as a plague. I still cant work out how it all hangs together, but it does, exquisitely. Probably my favourite track on an excellent CD. trivia - the vocals were recorded on a ship on the arctic ocean. Initially I used TalkBackToBasics to create audio versions of the Teisha related emails. I processed and manipulated these as loops which were then remixed to form the finished track. The source materials created in this project were quite varied and some will definitely be used in future projects. My initial reaction was that as a piece of noise music this was pretty good, but any connection with spam was not obvious. After a while though, you hear all the voices chattering in background. The sounds conjured up an image of some organic-mechanical hybrid. People trapped in a nest of mechanical rattlesnakes. Definitely not a place you want to be. Then it suddenly shifts into a different mode  peaceful, celestial, joyful, full or freedom. Whats this about? I read it as symbolic of how the internet could be without spam. 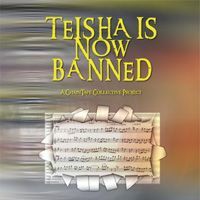 Teisha has been banned. Worth repeated listenings. Spam, junk mail, telesales, muzak, TV, cellphone, carphone, don’tstop, shop til you drop, silence is banned. Didgeridoo, native American drum, analogue electronic drone, transistor radio, electric guitars, softsynths, voice. I signed up for this song as it sounded like a great way to express some feelings on frustration. I was frustrated along with many other emotions when my wife left in June and would not speak to me…. but I could still get all the spam in the world whether I wanted it or not, frustrating…. I used a Roland Handsonic into a Gibson echoplex straight into my new Macbook. I played a Puerto Rican Cuatro made from Mango wood, along with some odd singing and whistling. I processed loops through an Alesis AirFX. I used some Garage band effects on some of the duplicate channels and some of the vocals. After a painfull and dangerous journey the author arives in India and has a chance meeting with Teisha. She has some joyous words for him before disppearing forever in the streets of Calcutta. Dictaphone recording, recomposed in Hars' living room in Vincennes. I originally planned a musical rendition of Gogol’s “Dead Souls,” only using spam names as my fictional serfs, or “Spam Souls.” I recorded names of spam senders for a while and then read them all off as fast as I could. I incorporated that within a jumbled tapestry or voices and noises. The title “I Be Circuitous” was actually a subject from a spam email I received. I knew immediately it would be the title of my track…. Oh yes. A good rhythm is trying to get established, but the voices in the background keep on getting in the way, forcing it to change. The voices, the voices, oh god, why wont they shut up. I cant concentrate. Its just non-stop, and I cant get passed this point  truly, I be circuitous. A really inventive piece, though I did wonder if it would have been even better a minute or so shorter. But maybe thats just my attention spam.